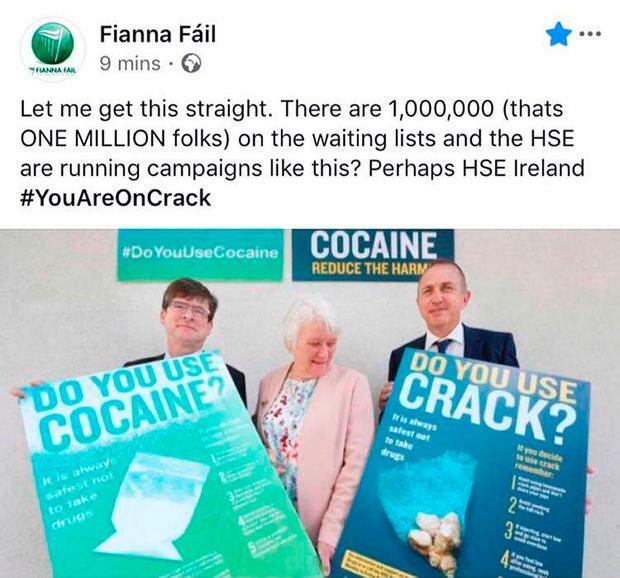 A doctor specialising in addiction has called on Fianna Fail to confirm where it stands on drug-reduction policy after a post on the party’s social media caused outrage. The main opposition party were forced to delete an official Facebook post criticising the Government’s drug reduction policy. The post has been widely criticised by drug treatment charities and rival politicians as cruel and misinformed. Labour Senator Aodhan O Riordain has called on Fianna Fail leader Micheal Martin to apologise for the post, calling it “degrading and deliberately divisive”. Dr Garrett McGovern, a GP specialising in addiction treatment, Priority Medical Clinic in Dundrum said the party should confirm to voters where they stand on drug reduction. “I wouldn’t have deleted the post. “I think it is important that people know where Fianna Fail stand on sensible drug policies and reducing drug-related harm. “It is not clear who actually posted the comment or if it reflects the general views of Fianna Fail. Charity Release Drugs said the post was dismissive of a serious issue. “Cruel, mocking statement, dismissive of a serious public health issue. Merchant’s Quay Ireland, who deal with those living with addiction in Dublin, said the post was disappointing. “Lives are being lost needlessly, we’ve one of the highest rates of drug-related deaths. Harm reduction works. Later, the official Fianna Fail Twitter account replied to criticism by saying: “We are not saying it’s wrong. “It’s the formulaic PR look of the campaign. A Fianna Fail spokesperson said: “This morning’s tweet was posted by a junior member of staff and does not represent party policy. The party added that official Fianna Fail submission to The National Drugs Strategy stated that more emphasis should be placed on prevention and education.